BT SIN 498 MCT Approved - New! DrayDDNS Service Support - New! Hotspot Web Portal - New! 4x4 Multi-User-MIMO (5Ghz) - New! Router-Assisted Client Mobility - New! High Availability (Hardware failover) - New! Up to 8 Private LAN Subnets - New! Larger Subnets - up to 1022 IPs per subnet (LAN1-3) - New! The Vigor 2862 series is our new flagship router/firewall. Exact feature support varies by model (see specification tab). It is what we've called the 'Ultimate DSL router' supporting both ADSL or VDSL (BT Infinity™/FTTC) and packed with professional level features to increase security, flexibility and functionality, making it ideal as your standard router for almost any scenario. A 5-port Gigabit Ethernet switch on the LAN side provides high speed connectivity for your server, other local PCs or for uplink to a larger Ethernet switch. Comprehensive security features include content filtering, web application controls and an object based firewall management system. 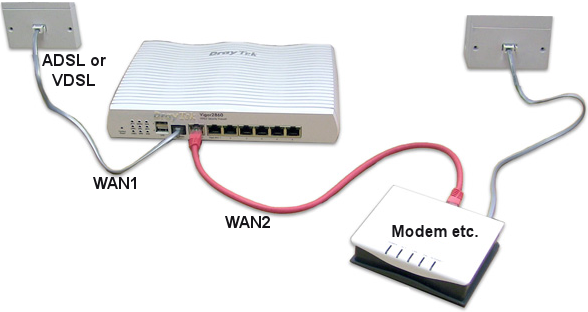 Port 5 is switchable with 'WAN2' to use it as an Ethernet WAN port instead of a LAN port*. The Vigor 2862 supports IPv6 - the successor to the current IPv4 addressing system that has been used since the Internet was first created. IPv4 address space is full up and IPv6 allows for much more efficient routing and a larger address space. IPv6 is supported both from your own ISP, but if your ISP does not (yet) support IPv6, the Vigor 2862 also supports IPv6 broker/tunnel services to provide IPv6 access using either TSPC or AICCU via 3rd party IPv6 providers. To learn all about IPv6, you can get our detailed guide to IPv6 here and you can view the IPv6 detailed support in the product specification tab. The Vigor 2862 features multiple methods of WAN connectivity - ADSL/VDSL, Ethernet, USB port for connection of a 3G/4G modem, optional built-in 3G/4G or (on wireless models) and Wireless WAN. The Ethernet port can connect to a second ADSL/VDSL modem (e.g. Vigor 130), a cable modem or any other Ethernet-based Internet feed. The multiple WAN interfaces can be used either for WAN-Backup or Load-Balancing. WAN-Backup provides contingency (redundancy) in case of your primary ADSL line or ISP suffering temporary outage). Internet Traffic will be temporarily routed via the secondary Internet access. When normal service is restored to your primary line, all traffic is switched back to that. port and can connect to a secondary modem/connection, such as another DSL modem. If you don't have VDSL or ADSL, the Ethernet WAN port can instead be used as your primary/only Internet connection (using NAT) so the same router can be used regardless of whether you have xDSL or Ethernet Internet connections currently. 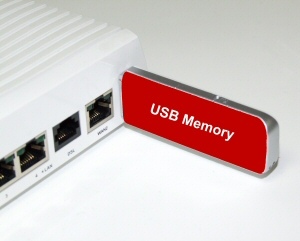 The USB port provides Internet connectivity (main, backup or load balanced) by connecting to a compatible USB modem (or cellphone) for access to the high speed 3G/4G/LTE cellular networks from UK providers such as Vodafone, O2, 3 and EE. If you don't have DSL at all, the USB/3G/4G access method can be used as your primary/only Internet connection, ideal for temporary locations, mobile applications or where broadband access is not available. Alternatively, if you will be making more regular use of 3G/4G/LTE, consider the Vigor 2862Ln model with its built-in cellular modem & SIM slot. Most commonly, your router will connect to the Internet via fixed line (ADSL, VDSL, cable) or cellular (3G/4G/LTE) but the wireless models for the Vigor 2862 series, such as the Vigor 2862ac can use a Wireless connection as its WAN (Internet) feed, using it either as a primary or backup Internet connection. For instance, the Vigor 2862ac can connect to your mobile phones wireless hotspot facility and use that as an Internet connection, or load balancing it with wired connections. Importantly, when using this feature, your own Wireless LAN still works - i.e. the wireless base facility provided to your laptops/phones/tablets by the Vigor router still works. The RM1 Rackmount Bracket enables you to fit any Vigor 2862 series router into a standard 19" rack or cabinet. The bracket takes up one rack slot (1U) and includes a cable retainer at the back to keep the power cord captive. The front mounted sockets of the router remain fully accessible. For wireless models, we then recommend extension aerials (or aerial extensions).